Making a late entry onto our list of Christmas/Holiday gift recommendations is the Tiny TS, a credit card-sized (100x65mm) fully open-source synthesizer with a 1-octave capacitive touch keyboard. The synth has Audio/CV/Gate outputs and six synth parameter dials. The keyboard can also turn controller by utilising the CV outputs: 1V/oct and Gate. Controls for the DCO include Coarse pitch and Double. The CV out follows the keyboard and coarse pitch. The DCF features Filter peak and ENVmod controls, while Attack and Release controls affecting the amplitude take up the ENV section. 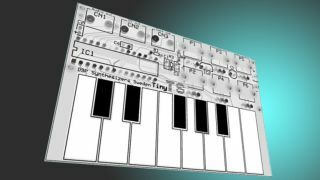 There are several purchasing options for the Tiny TS, so whether you want to play right away or get stuck into building one yourself, this tiny synth has got you covered. The Tiny TS is available now and more information can be found on the DIY Synthesizer website.